Croissants are potentially my favorite food. When made correctly, they are flaky, buttery, crisp, and subtle. They are equally delicious with sweet or savory fillings. They can be both a breakfast food and a dessert- possibly in the same meal. But, despite this potential for greatness, many people have had only mediocre croissant experiences at best. This is not right. I firmly believe that every person should get the opportunity to eat one earth-shatteringly good croissant in his or her lifetime. Depending on where you live and what kind of bakeries are nearby and if you've ever been to France, the easiest way to do this may be to take fate into your own hands and make them yourself. Making them at home is a daunting task, I know. I was extremely daunted the first time I made croissants. But it's also an enjoyable and relaxing process. The smoothness of a properly laminated dough is nearly unparalleled. And the complete satisfaction of pulling a tray of crackly croissants out of the oven is entirely unparalleled. The origination of the croissant and how it got to France is the stuff of legends. Some claim the croissant first appeared in Budapest. One famous story tells of a baker living in Vienna in 1683 while the city was under siege by the Turkish Army. One night as he was dutifully working late into the evening, he heard a strange noise. Upon further investigation he discovered that the Turks were attempting to tunnel under the city gates. His discovery led to the defeat of this attack. As a reward, the baker requested and was granted the sole rights to bake crescent shaped rolls - the crescent being the symbol of Islam - as a reminder of the defeat over the Turks. Interestingly, though this rumor has been debunked, it lead to the banning of the croissant by some Islamic fundamentalists (read this 2013 Washington Post story). Another popular tale attributes the introduction of the croissant to France to none other than Marie Antoinette. Supposedly the 15-year-old Austrian was so homesick after moving to France that she convinced the royal baker to make his own version of her native kipferl, and the rest is history. Despite these glamorous origination stories, historians more or less agree that the actual first time croissants appeared in France was in the late 1830s at Boulangerie Viennoise, a bakery in Paris run by a Viennese journalist named August Zang. Zang offered a flakier, lighter version of kipferl, which patrons referred to as 'croissant' due to its crescent shape. Finally, the modern yeasted croissant, utilizing the same laminating technique as pâte feuilletée, appeared in a 1915 recipe written by French baker Sylvain Claudius Goy. This unfortunately coincided with World War I, during which sugar was so scare that the sale of pastries was actually temporarily banned in France. After World War II, mass production of foods, including croissants, became extremely popular and even many French bakeries were lured to the cheap prices of pre-made frozen croissants. Mass-produced croissants gained popularity in America as well with the introduction of a Pillsbury Crescents in 1965 and a Sara Lee frozen croissant in 1981. 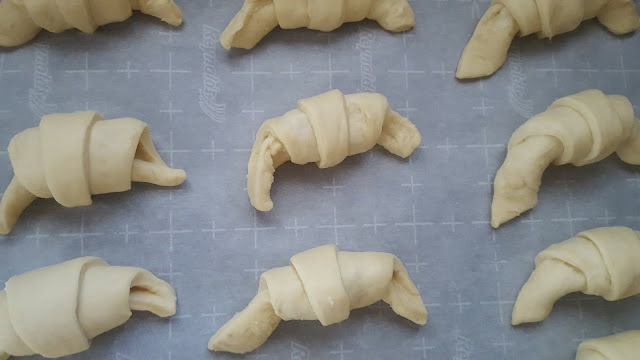 The ease of frozen croissants remains popular to this day, and is said that 30 to 40 percent of croissants produced in France today start out as frozen dough. 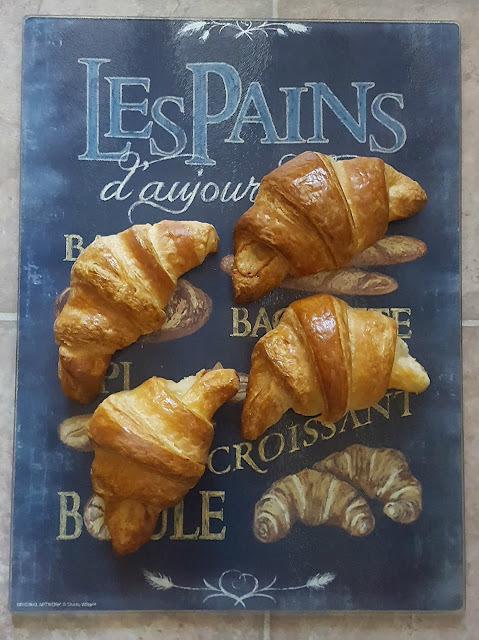 However, some French bakeries have begun to fight back against the industrialization of the croissant by putting signs in their windows advertising their croissants as "fait maison" or homemade. I would also like one of these signs. I will also put it in my window but it will mainly just confuse my neighbors. But basically what I'm saying here is that by baking croissants in your home, you are doing your part to fight back against mass production of food and food company giants! And you can probably make your co-workers happy too if you bring the extras into work. Stay tuned for my next post where I will explain why you should actually follow the recipe when baking croissants! 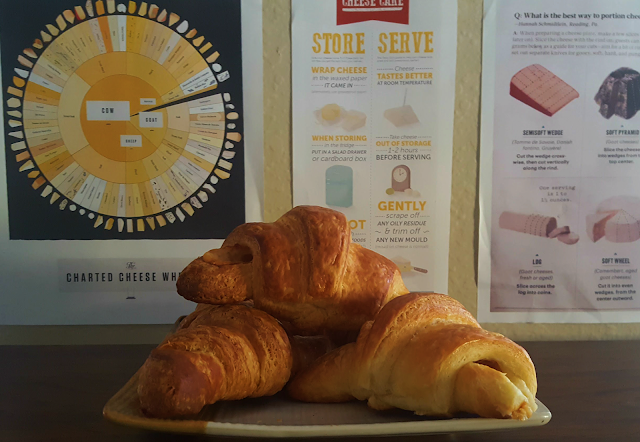 Some croissants paying homage to their French roots. I'm ready for the recipe now! I will try to put it up faster, just for you! Hi, I'm Joanna. I write about the science and history of baked goods and share recipes. 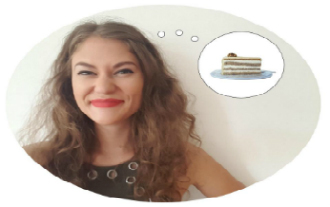 And I think about cake. What baked good is most intimidating for you to create?